We drink lots of water in our home but knowing that our tap water is less than perfect, not only is there the risk for bacteria but sometimes it smells downright fishy and sometimes it smells like chlorine. So, we buy bottle water instead. It is more expensive and creates lots of unnecessary waste. Being a parent I want my little girl to drink water that is free of bacteria and other harmful elements that could end up in the city water. We received a ZeroWater pitcher for review and I’m very happy to share our wonderful experience with this product! ZeroWater offers pitchers and filtration systems that filters your tap water through 4 technologies to remove the yucky dissolved solids in the water. The first layer is activated carbon and oxidation reduction alloy that removes the chlorine taste. The Ion Exchange removes virtually all dissolved solids that could be leftover from public water systems or even come from the piping like Aluminum, Lead, Zinc, Nitrate and more. Then there are three additional stages of filtration it goes through to remove other impurities and ensures your water gets treated so it can give you a 000 reading on your TDS (Total Dissolved Solids) meter. Using the ZeroWater pitcher is really easy and takes only a short 10-15 minutes to do. All you have to do is fill it with your tap water with the filter in place, the water will quickly go through the filtration process and the pitcher will start to fill. I leave the faucet on a slower setting while it fills so it gives our ZeroWater pitcher time to filter it. In a matter of minutes the pitcher is full and the water is ready to drink. I love having the TDS monitor because it lets me test our pitcher to be sure it is filtering and giving a 000 reading. If it hits 006 than I know its time to replace the filter. The top of the pitcher has a place to put the TDS monitor which is nice because it’s right there when you want to test. The pitcher holds 10-cups of water and doesn’t’ take up too much space in the fridge. Plus, you can pour from the spout or use the spout which is nice when you don’t feel like taking the entire pitcher out. I love knowing my family is drinking clean water and how easy it is to use, every household should have one and at only $34.99 for the 10-cup pitcher its a small price to pay to know your family is drinking clean pure water. 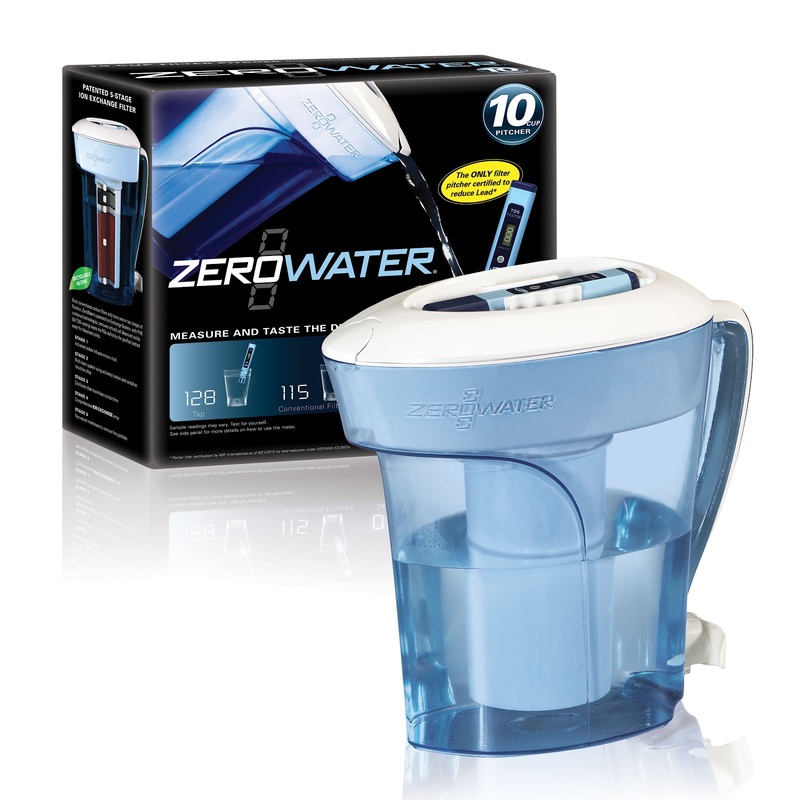 The ZeroWater 10-cup pitcher (includes 1 pitcher, 1 filter, 1 TDS meter, and coupons!) is available at www.zerowater.com for $34.99. Plus, use the code blog15 and you’ll receive $15 off a 10-Cup pitcher! ZeroWater is giving one lucky winner the ZeroWater 10-cup Pitcher! To enter, fill out the Rafflecopter form on the Mother’s Day Gift Guide giveaway! Staying hydrated by knowing how much water to drink is crucial to our health and it can also eliminate the worry of ever becoming dehydrated especially when working out. This looks great, I’d love to have one for our house and I’m very curious what our tap water would read on the TDS meter. How cool! I want one, I’m sure our tap water is full of contaminates that I’d rather not drink. We usually have bottled water but this would be so much better. Thanks for the review, I’m going to look into getting one! my mom would love this for her birthday…. I just got one of these yesterday and I am super excited to give it a try. Thank you for the review. Wow, that is a big difference from 118 to 000! It’s nice to know that the ZeroWater filtration system really works and a comfort to have safer water for your family.